I am not one to carry a bottle of hot sauce in my bag wherever I go. I do have an uncle that proudly does. Wherever he travels, his Tabasco sauce eagerly jumps out of his bag and splashes its somewhat flavorless heat on whatever food it happens to come across. Yep, fancy restaurants too. Now I know… Mexicans have the reputation of loving to eat everything with chiles. I admit this to be true. As Fray Bartolomé de las Casas, Spanish priest, defender of indigenous people, and chronicler of early colonial times said in the XVI century: Without chiles, Mexicans do not consider they have eaten. Hmmmm… the same can be said today. With the caveat, that it’s not just the heat that we crave. Most Mexicans are picky chile eaters. Since we have so many varieties, and such varied and distinct ways to use and prepare them, we can exquisitely discriminate how and what we pair them with. We love their different flavors, textures, fragrances and personalities. It is like considering different kinds of fruits. So my uncle is more an exception than the rule. All this to say, without any excuse, that although I am not a hot sauce bottle kind of woman, I am a pickled Jalapeño kind of gal. But I do have my limits… just like reasonable limits most pickled pickles kinds of people have. They may eat a pickle with different kinds of sandwiches; how about a schnitzel with mashed potatoes; it sounds good with a thick and juicy veal sausage with sauerkraut; and of course a fresh bagel with lox… But it would be surprising to see pickled pickles kinds of people eat them with a bowl of Spaghetti Marinara. I don’t want to judge, people should eat whatever they want along whatever pickle or salsa they want. But it does make sense to have some guidelines to help us define and enjoy the world we live in. So no pickles with ice cream for me. And no… my pregnancies were not an excuse for that either. Yet, it was really funny to see the surprise on my friends faces when we walked into a Pizzeria in Cape May about a month ago, after I asked the Pizza man if he had pickled Jalapeños as a side or as a topping. His face was not only as surprised as my friends’ were, but it also gave me the quick and definite answer. NO! (which really felt like an are you crazy woman?). So there you go, if I were to move to a part of the world where there are no pickled Jalapeños, or fresh Jalapeños to pickle, I would bring my own (along with a can of chipotles chiles in adobo sauce and a jar of homemade salsa verde). When Mimi and David, a couple of our surprised friends, invited us to their house for a homemade Pizza party this coming Saturday I asked “what can I bring, please?”. But then, I couldn’t help but say “instead of the salad… can I bring some homemade pickled Jalapeños?”. Ok, that wasn’t very polite of me..
Let me please explain: Pickled Jalapeños may not work with everything, but they do work on an incredible number of things: sandwiches, tortas, quesadillas, as a side to scrambled eggs, enfrijoladas, grilled meats, rice.. I could go on… Oh! My Colombian friend Tamara, just as plenty of Mexicans do, nibbles on them right out of the jar. The important thing here is that they are spectacular over Pizza. So much that Pizzerias in Mexico typically offer them as an optional topping. As promised in my last post, here’s my favorite way to pickle your own Jalapeños. They tend to be pickled with other vegetables like onions, garlic and carrots, which is what I typically do. There are other versions that add other ingredients like previously boiled baby potatoes, green beans, cauliflower and cactus paddles… Wonderful as well! Feel free to play with the ingredients that wink an eye to you. 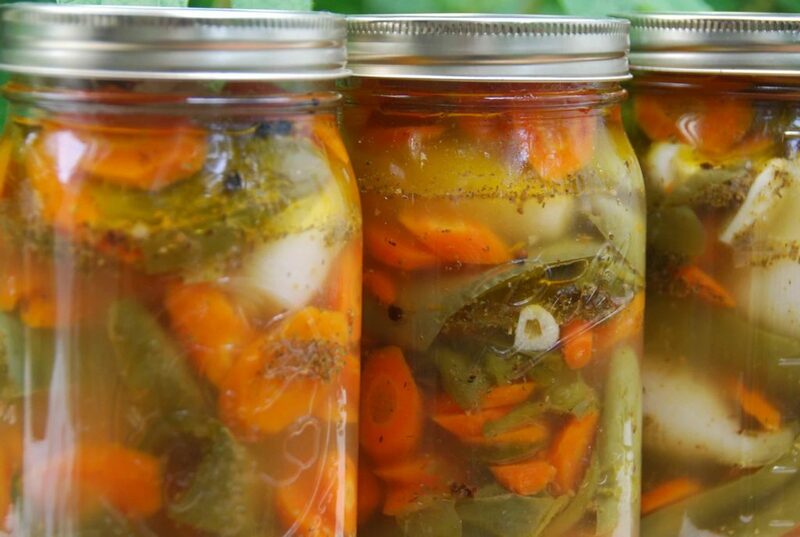 One of the wonderful things about pickling, is that aside from not being complicated, it brings out certain characteristics of the ingredients you are working with in an unusual way and it also prolongs their life in that stage. This recipe makes a big batch, because they are likely to go fast, and also because since it takes a bit of time to make them, I like to make a bigger amount. They will last ages in the refrigerator if they don’t go as fast as I predict. And next time you eat Pizza, give it a try! If you don’t want to make them, there are many brands in most supermarkets that sell them already canned and delicious. NOTE: I don’t typically recommend the use of gloves for cooking, but since this recipe involves cleaning quite a few chiles, you may want to use gloves. If you don’t and your hands burn a little, wash them with warm water and soap, or rub them with a spoonful of oil, or soak them in a bit of milk, sour or heavy cream or ice cream. Any of those methods should take care of it, as they help dilute capsaicin the somewhat oily substance which contains the heat in chiles. Rinse the jalapeños, remove the stems, slice in half and scoop out the seeds (since they are quite a few chiles to clean you may want to use gloves). Place them in a large mixing bowl. Rinse the carrots, remove their tops, peel and diagonally slice into about 1/4" thick. Place in the large mixing bowl along with the Jalapeños. Peel the pearl onions of the outer dry skin and add into same bowl. Sprinkle all these vegetables with the salt, toss around and let them sit for about an hour. Place the white distilled vinegar in the blender along with the water, peppercorns, cumin seed, whole cloves, bay leaves, thyme, oregano and brown sugar. Puree until smooth. In a large, deep and thick skillet, heat the oil over medium-high heat until hot, but not smoking, for about 2 minutes. Carefully add the salted vegetables, reserving their juices, and fry for about 6 to 8 minutes, stirring here and there, until they begin to soften. Add the garlic cloves, and cook for 2 more minutes. Carefully add the vegetable reserved juices, along with the white distilled vinegar mix and the rice vinegar. Let it all cook for about 5 more minutes. Turn off the heat and let it cool. Your show inspired me to visit Vallalodid last year and I’m going to Oaxaca this year. Yayy! Question about this recipe? Can I leave the seeds in for more heat? Assuming yes. can you use fresh bay leaves instead of dried? Pati, I must admit I just came across your show on Amazon. Let me just say I have been missing all these wonderful recipes. I came across your recipe while searching for an Escabeche recipe. I visit the Yucatan quite frequently and always make a trip or two to Don Cafeto in Tulum for their wonderful Escabeche. I have pleaded with staff and owner for the recipe. Alas, my pleas go unanswered. So, I just end up purchasing a container of this delicacy to nibble on while on the bus ride back to Playa Del Carmen. Thank you so much for sharing your fantastic recipes with us all. Saludos, besos y abrazos desde California! Oh thank you so much Armando…I’m so happy you found the show and the recipes! How many bay leaves are you supposed to use? This is my go-to recipe for pickled jalapeños! Several friends expect a jar every time I make them! I notice though that the ingredient list now doesn’t include the number of bay leaves. I recall it’s quite a few and I’m all set – but newcomers will need to know. Not sure if that’s due to the new site. Gracias! I harvested the last of my Jalapeno peppers and went online in search of a pepper, carrot and onion recipe and came across your site and I am soooooo glad I did. The recipe is awesome. I can’t wait to try other recipes of yours. I think a testament to authenticity of your recipes is that comments are in both Spanish and English. You are definitely bookmarked. I am thrilled you like the recipe, Mara!! I just found your show and now your website. I love to cook Mexican food. So very excited to try some of your recipes. I also love pickled jalapeños. When I buy the canned version, I prefer the whole ones. I eat them with all kinds of food and cook with them often. Have you ever tried this recipe with whole jalapeños? Is there any reason at you would not? Hola Guy, I haven’t tried it with whole, but I say go for it! Though they will be more spicy since the seeds are left in. I’m thinking about pickling Nopales…I’m wondering if this recipe can also work for that? Have you pickled nopales before? any tips? Hi Mayra, Yes, you can try this recipe to pickle nopales. The only thing I recommend you do differently is to salt the nopales separately from any other vegetables you may use and discard their juices, since they may be gelatinous. If you try it, let me know how it turns out! One more question 🙂 I made these today and I think they are going to taste great, but I’m wondering if it’s okay and normal for the liquid to not cover all of the veggies in each jar. I put the mixture in 4 quart size canning jars and one pint size, and tried to distribute the liquid evenly among them, but none of them are more than 2/3 full of liquid. Maybe that is only important if you are following a formal canning process? I did a lot of the steps of canning–like sanitizing the jars, soaking the lids, etc., but in part because the liquid is too low I know these will be strictly fridge storage and that’s fine. Just wondering if it’s normal for the bring not to cover all those tasty jalepenos and carrots. Thanks again for the recipe! I have been waiting a few days until I finally have enough jalepenos to at least do a half batch of your recipe, using some from my own plant and some I bought at the farmers’ market. I still have a couple things left to get together but I’m wondering if it’s really bad (ie dangerous) to use these jalepenos that are ever so slightly shriveled, as a few of them have been in my fridge for a week. They are just a little less than perfectly fresh and I wonder if I dare pickle them. Thoughts?? Thanks! I just came upon your blog looking for a way to pickle jalepenos and I know I will use it for many other recipes as well! I just made these pickles (with fresh bay leaves – as it happens – works well!) from your book. They are absolutely awesome! Do you use fresh or dry bay leaves for this recipe? Hi Pati! Can I tell you how happy I am I found your recipe??? I found myself with way too many jalapeños and decided to pickle them since I can never get enough of pickled anything. I just made my first batch last night and they taste soooo good, very flavorful. And soooo spicy! The other recipes I found online seemed so bland, I appreciate your recipe and this website!! Ahora si me queda claro. muchisimas gracias Pati, tu blog esta muy interesante. Aqui en el pueblito en el que vivo si se consiguen “Jalapenios” que en verdad son chiles Cuaresmenios. Asi que hare la receta y ya te contare como quedaron. Un caluroso agradecimiento. Paty acabo de leer tu receta y en ella mencionas el vinagre blanco, pero despues mencionas vinagre de arroz… Cuanto vinagre de arroz? no lo enlistas en la receta. Me confundi un poco, me ayudas? Josee S. de Hillsburgh, Ontario, Canada. Josee, puedes hacer mitad de arroz y mitad de vinagre blanco o puro vinagre blanco… Con gusto! 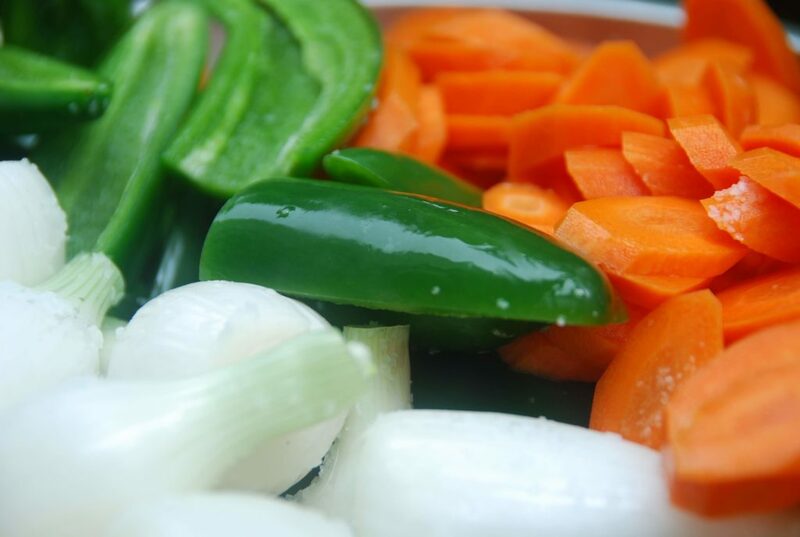 Your recipe for pickle jalapenos & vegetables is the bomb! My family and friends can’t get enough. I have made this recipe several times & also added broccoli & celery as well as cauliflower. Please continue with your awesome recipes. I thoroughly enjoy receiving your updates and new recipes. Saludos! Una preguntita Pati, en la receta, muestra que se use el vinagre de arroz y vinagre blanco. Le cambia mucho el sabor si le sustituyo el vinagre de arroz por vinagre blanco? Sabria mas fuerte? Ana, no te preocupes, te va a quedar igualmente delicioso! Con el purito vinagre blanco sabe un poquito mas intenso, pero no gran diferencia. Riquísimo igual. Can these be “canned” so that they dont have to be stored in the refrigerator? If so how would I go about that? I was given alot of carrots and jalepenos and my hubby loves them pickled so I want to try but not dont have alot of frig space. Hola Jeri, Of course, you can can them! Just follow the formal canning process, or the instructions on your canner (if you have one). Hello! After seeing your recipe I’m really jazzed about trying it, however I’m trying to gauge how hot (or not) it will be. Most recently I’ve been buying “La Morena” brand, which appears to just used sliced jalapenos without cleaning/seeding. If I followed this same procedure, would your recipe be roughly as hot? Any tips, hints, admonitions, guidance, wisdom? Thank you very much for all your delicious recipes! My recipe wouldn’t be as hot, because I seed the chiles. They get a bit tamed with all that treatment. Let me know what you think! In Texas we eat jalapeños with or on our pizza also. Your recipe sounds like just what I was looking for. Can’t wait to try it even though I will have to buy the peppers since it is the wrong season to have any in the garden. You can do it in the way I describe and keep in the refrigerator, or you can process the jars according to your canner instructions. You don´t need to alter the recipe, just the finished step. Hope you enjoy Irene! When I pickle jalapenos I use 1 part vinegar, 1 part sugar and 1 part water and just a pinch of salt (some pickling seasonings if you like)which creates a sweet/hot taste and lots of flavor.I find other pickles too salty. Hi Thom, Thank you for sharing your method!! The sweet/hot tastes sounds delicious! I will have to try. I assume that this recipe can be halved pretty easily? I’d like to pickle cauliflower florets using your jalapeno recipe. how would I prep the cauliflower? I really enjoy your show and look forward to each weekly episode! That is a great idea! I’d only quickly cook the cauliflower florets in boiling water for 3 to 4 minutes, and then add to recipe at same time as other vegetables. If you find you are missing pickling liquid, just add water to cover. I love your show! learning to speak Spanish anyway thank you for the pickling for carrots and such. Mark, Thank you so much!! Glad you are enjoying the show, and good luck with the Spanish! @michelle Jan 23 – You can order mason jars from Ace hardware on the web and they will deliver them to the hardware store you designate. I got a case of 12 quart jars for about 12 bucks I think. It’s the kind with the dome lid and screw-ring that goes over the dome. Fine for processing in hot water bath. I would worry about those rubber gaskets after being exposed to corrosive chile and vinegar mix. Pati, love your recipes. Best tool I ever found for cleaning chiles is a grapefruit spoon, try it! Great idea about the grapefruit spoon!! Never thought of that one! Hi, Patti! We keep a jar in the fridge all the time and we too put it on pizza, salads, burritos, a lot of foods. We like it super hot so we use scotch bonnets and jalapenos too. Thank you for all the yummy recipes! Hola Marie, Thank you for writing to me!! I like the idea of adding scotch bonnets, too. Do I dare? can we use ground comino? And if so… how much… when I make salsa I usually use ground comino… thanks! Yes you can! I’d use half a teaspoon.. Enjoy! Thanks for the recipe! I’ve been trying a few different pickling recipes to compare. This looks delicious! Do you know if this is safe to can? I recently watched your show about your father’s ham and cheese tortas and got so inspired I decided to make your pickled jalapenos. I used the last of my husband’s garden jalapenos and shallots. I haven’t tasted it yet since it is still cooling, but I am very excited and can’t wait make a delicious torta like yours with ham, cheese, avocado, tomato, refried beans, crema and pickled jalapenos! I can’t wait to try this recipe. I have some beautiful Habaneros and super chilis growing in my yard and was thinking of adding some of them to this recipe. What do you think? Hi I’m going to try this recipe tomorrow but I’m wanting to store them for longer times than just in fridge..I’m wondering if you think I can pressure cook our water bath thesefor storage? We enjoy picked jalapeños on everything! My husband likes la costeña jalapeños best shop I’m thinking this recipes fits the bill…can you email me please! good story about the hot sauce, i get my wife to carry my bottle of shiracha for me. grew up on Tabasco. thanks for the recipe. and yes i think i can talk my wife into carrying a bottle of pickled peppers for me too. Is this the way the pickled jalapenos and carrots are made in the Mexican restaurants in San Diego? It’s been 10+ years since I’ve been in California and I miss this treat so much. I’m not sure how the pickled jalapenos are made in those restaurants, this is the recipe I was taught by my family, growing up. I hope you try it out the recipe and let me know if they are similar! Yes! You can use ground cumin instead, they will be just as good. Wow, Pati! I love, love, love this recipe for pickled jalapenos. YUM! I am pretty sure everyone in my family will be getting a jar of these for Christmas. Cant wait to try the picked onions! Oh! They do make for perfect holiday gifts! Just made a batch from this year’s peppers. My mouth is already watering thinking about eating them on pizza! We couldn’t get enough of them last year! Thank you! Ok, Great! I am looking for a shelf stable recipe as i don’t have a ton of room for storage in my fridge and I do have a ton of Jalapenos this year. I am going to try this recipe tonight though because it looks amazing!!! will these peños be shelf stable? Or are they fridge only? I always go with fridge! Just wanted to share that I recently made these pickles (they came out great — just like at the taqueria!) and a day or so later I had some leftover pizza in the fridge, so I ate it with the pickles like you suggested and it was amazing!! Thanks for the tip! 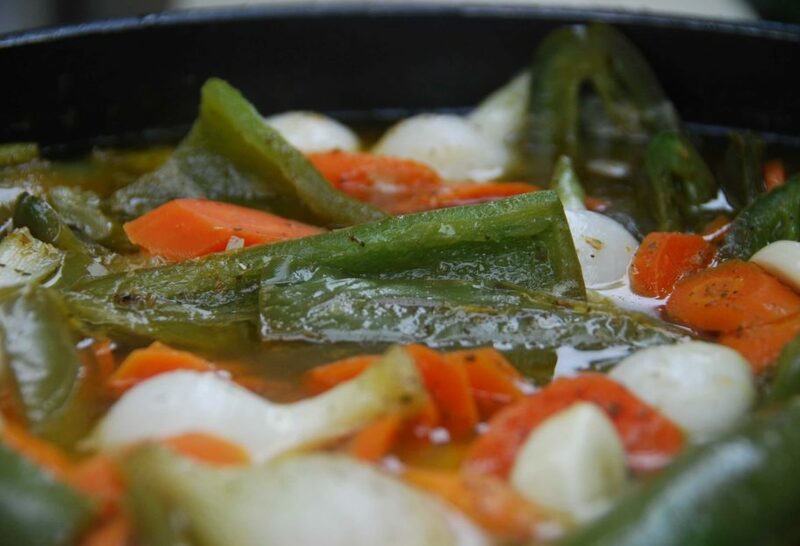 Can I use this recipe to make “nopales en escabeche”? I am fairly new to your blog and I love it. My mom is from Mexico but unfortunately she does not cook alot of the traditional foods so I try to learn from others. Do you know how hard it is to find a website that is more authentic than not? It is very hard to find them in English. I can read Spanish but I sometimes struggle with not always being familiar with the ingredients or measurements. Gosh – you are right, these are the best. It’s like eating candy. Thank you for sharing with everyone. Hola Patti, my mouth is already watering just reading the recipes. last night i cut up the vegies and now i’m ready to begin. is it possible to process them while hot so that they’ll be preserved long enough for me to safely give them as regalos de navidad? You know, with sterile jars that create a vacuum and won’t produce botulism? Yes! Absolutely. You can also let them cool, cover tightly, making sure that liquid covers the vegetables, and refrigerate. They will keep in the refrigerator for ages. It sounds like a wonderful, useful Christmas present with such a nice kick! This recipe is amazing – thank you so much for sharing it! To other people considering this recipe – wear gloves, as the recipe suggests! Dear Julia, So happy you liked those chiles! There is nothing I like more than when recipes are tried out and liked… It is my pleasure to share… I will keep on posting more. Necisito tu ayuda… Tenemos en nuestro jardin una mata de pimientos rojos super calientes. Pensaba usar tu receta de “pickled jalapenos” pero queria consultarte primero. Que crees, funcionaria con otros pimientos? Sabes cómo se llaman los chiles que tienes y mas o menos de que tamaño son?? Puedes mandarme un email.. In your recipe for pickled jalapenos you mentioned adding the garlic cloves twice.I was wondering if I was just supposed to blend them,saute them,or both.Please email me back. Pat: que delicia, voy acorrer a hacerlos, te falto poner que con un plato de frijoles y tortillas no hay nada mas delicioso. Te felicito tanto, cada vez que veo tus recetas quiero meterme a la cocina y con tu manera de introducir el platillo mas se antoja, te quiero. Sharon. Yes, yes, yes! My sister is right! Sharon, Pickled Jalapeños with beans and tortillas have no match… Shar, I looooove you too…. Pat : you rock ! what amazing recipes,they all bring me back to my childhood and just to think of those memories I want to back in the kitchen, on and on again ! Tu Mama me acaba de mandar tu site … no sabia que ademas de Mama ….tus estudios …. te dedicas a esto … tan diferente ..!!!! Creo que el exito culinario todas se lo deben a Susy .. ayer nos invito a su casa y su comida fue espectacular ..